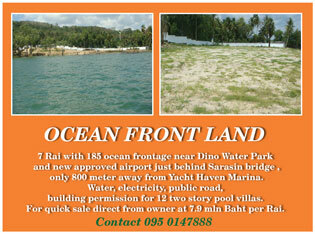 7 Rai with 185 ocean frontage near Dino Water Park and new approved airport just behind Sarasin bridge , only 800 meter away from Yacht Haven Marina. Water, electricity, public road, building permission for 12 two story pool villas. For quick sale direct from owner at 7.9 mln Baht per Rai.